The coastal zone is one of the most dynamic environments on our planet and is much affected by global change, especially sea-level rise. Coastal environments harbour valuable ecosystems, but they are also hugely important from a societal point of view. 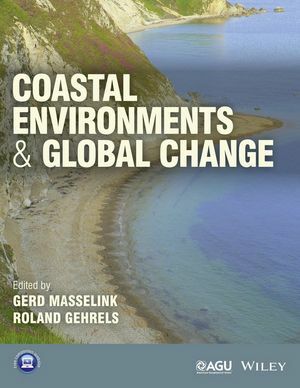 This book, which draws on the expertise of 21 leading international coastal scientists, represents an up-to-date account of coastal environments and past, present and future impacts of global change. The first chapter of the book outlines key principles that underpin coastal systems and their behaviour. This is followed by a discussion of key processes, including sea level change, sedimentation, storms, waves and tides, that drive coastal change. The main part of the book consists of a discussion of the main coastal environments (beaches, dunes, barriers, salt marshes, tidal flats, estuaries, coral reefs, deltas, rocky and glaciated coasts and coastal groundwater), and how these are affected by global change. The final chapter highlights strategies for coping with coastal change. Readership: final year undergraduate and postgraduate-level students on coastal courses in a wide range subjects, including geography, environmental management, geology, oceanography and coastal/civil engineering. The book will also be a valuable resource for researchers and applied scientists dealing with coastal environments. Gerd Masselink is a Professor in Coastal Geomorphology and Associate Head of Marine Science in the School of Marine Science and Engineering at Plymouth University, UK. Gerd specialises in nearshore sediment transport processes, surf zone hydrodynamics and beach morphodynamics. Roland Gehrels is a Professor in Physical Geography at the University of York, UK. He studies sea-level changes over various timescales, but has a particular interest in regional sea-level variability during past centuries. Roland is the President of the Commission on Coastal and Marine Processes of the International Quaternary Union (INQUA). The Editors have published over 160 peer-reviewed articles in coastal and sea-level research.